This past summer student and translator Annie Bien requested Reverend Khyongla Rato Rinpoche to teach the The Medicine Buddha Sutra. Rinpoche then asked Annie to translate the sutra, which he then used for the lecture. We are posting Annie’s translation entitled, “The Mahayana Sutra known as ‘The Distinctly Vast Previous Prayers of the the Arya Bhagavad Medicine Guru Vaiduryaprabha,” or Medicine Buddha Sutra for short. We thank Annie for all her hard work. Click on link below for PDF. Rinpoche is from the prestigious Ganden Shartse Norling College in Mundgod, India, and Gyuto Tantric University. He studied under the great masters Ven Khensur Lobsang Choepel, and His Eminence Kyabje Khensur Lati Rinpoche, both ex abbotts of Shartse College. From 1979 to 1988 he studied Pramana Vidya, Prajnaparamita,Madyamika,Abhidarma, and Vinaya. He was awarded the precious Geshe Lharampa degree. He speaks five languages in addition to Tibetan. 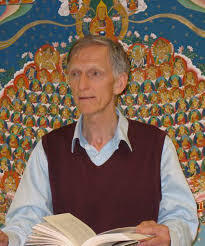 Born in Britain,Gareth Sparham lived as a Buddhist monk among the Tibetan exile community of Dharamsala, India, for twenty years and studied through the Institute of Buddhist Dialectics from 1974 to 1982. Sparham earned his Ph.D. in 1989 from the University of British Columbia. He retired from his position as a lecturer in the Department of Asian Languages and Cultures of the University of Michigan. Dagpo Rinpoche was born in 1932 in Tibet and at a very young age was recognized by the thirteenth Dalai Lama as a reincarnation of an important Buddhist teacher. When he was six years old he entered the Bamchö monastery in the Dagpo region where he learned to read and write and also learned the basic principles of Buddhism. At thirteen years of age he entered Dagpo Shedrup Ling in order to study Buddhist philosophy. Eleven years later he continued his studies in the large monastic university of Drepung, close to Lhasa. There he was admitted to Gomang Dratsang, one of the four colleges of the university. Guided by some of the greatest twentieth century Tibetan masters including the mentors of the Dalai Lama, Kyabje Trijang Rinpoche and Kyabje Ling Rinpoche, the fourteenth Dalai Lama himself AND the Mongolian master Geshe Ngawang Nyima, Dagpo Rinpoche was educated in the purest and strictest monastic tradition. Under their guidance Rinpoche studied the Five Great Texts, Tantra (Rinpoche received many initiations and performed many retreats) and astrology, grammar, poetry and history. In 1959 Dagpo Rinpoche fled to India. Less than a year later he was invited to France to assist French tibetologists in their scientific research. From 1961 until his retirement in 1993 Rinpoche taught Tibetan language and civilisation and Buddhism at the School of Oriental Studies, (I.Na.L.C.O.) a part of the Sorbonne. He has co-authored a number of books on Tibet and on Buddhism. Now retired, he continues his personal research, practice and studies. In 1978 Rinpoche founded a Dharma centre in France, which received Buddhist congregation status from the French state and became Ganden Ling Institute in 1995. In 2005 a new temple was opened in Veneux-les-Sablons, where study weekends and retreats under the guidance of Dagpo Rinpoche are organized regularly. Since the late seventies Rinpoche has shared his vast knowledge of Buddhism with a wide public. On their request he teaches in various European countries, in Asia and in the United States. He has founded Dharma centres in France, the Netherlands, Malaysia, Indonesia and India. He travels to India yearly to maintain contact with his teachers and monasteries. In 2005 Dagpo Rinpoche completed a long term project, the reconstruction and transfer of the Dagpo Shedrub Ling monastery to the Kullu valley in Northwest India. We were very fortunate to receive many teachings in August from Khyongla Rato Rinpoche and Venerable Nicholas Vreeland. Ven Geshe Vreeland gives a talk on Shantideva's Guide to the Bodhisattva's Way of Life, Chap IV Conscientiousness, Pt 3, from May 2009. June was chock full of teachings at The Tibet Center. The Venerable Khyongla Rato Rinpoche gave three lectures on the Three Principal Aspects of the Path with Ven. Nicholas Vreeland translating, and on June 28 visiting lecturer Jigme Neal taught on Tong Len. Jigme Neal will teach on Tong Len with a bit of meditation Q&A, in the context of the three principle paths and steps towards developing Bodhicitta as background for Tong len. James (Jimi, Jigme) Neal was born in Trieste Italy in 1948, and grew up near Seattle, USA. Studied Acting, music and revolution at university until 1971 when he departed to India overland via Europe. On his second journey to India and Nepal in 1974 he first met Lama Yeshe and Lama Zopa Rinpoche at the 7th Kopan medaocourse in Nepal and has been studying, practicing and teaching Buddhism from then up to the present time. Jimi was a fully ordained monk from 1980 to 1995. In 1981 he was one of the founding monks at Nalanda Monastery in France at the request of Lama Yeshe. He has had the good fortune to have taken extensive teachings, initiations and commentaries in Sutra and Tantra from His Holiness the Dalai Lama, Kyabje Song Rinpoche, Ling and Serkong Rinpoche, Kirti Tsenshap Rinpoche, Dilgo Kyentse Rinpoche, as well as his own root Lamas: Lama Yeshe and Lama Zopa Rinpoche. He has completed retreats on the preliminary practices, Vajrayogini, Heruka, Yamantaka and others over the span of the last thirty years. He has lead retreats and taught the Dharma at FPMT centers India, Nepal, America, France and Spain as well as teaching throughout Israel. He has lived in India for most of his adult life and presently resides near Dharamsala with his wife Valerie.